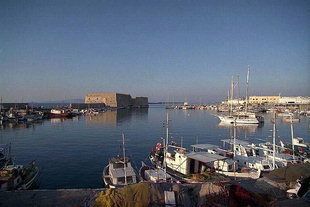 Heraklion is the capital of Crete and of the prefecture of Heraklion. It is easily accessible from Athens by at least four flights a day. There are international flights from Heraklion to Frankfurt and to Amsterdam. Between April and October there are charters from many other European cities. Heraklion is a very busy city, especially during the tourist season, so it is advisable to book reservations for accommodation before arrival, especially during August. If you are travelling by car there are parking lots near the end of Kalokairinou Street at the Chanioporta and below the Archaeological Museum, one of the many uses of a medieval moat. Make use of them and take the opportunity to see the historical monuments. As you walk up 25 August (Odos 25 Avgoustou) Street you will see numerous agencies advertising tours of all kinds. Santorini, Rhodes, and Mikonos are some of the most visited islands. You can also arrange tours of Knossos, Festos, Gortyn, and the Samaria Gorge. Most of the offices are professional and offer good value. However, to avoid confusion and disappointment, pay attention to the details of the trip, such as: the time of pick up, time of arrival at site, time spent at site, and entrance fees; these may sometimes be vague. The National Road is easily reached from Heraklion. You can drive to Agios Nikolaos in 1 hr (72km) and Chania in 2 hours (137km). This road is enjoyable and the scenery is spectacular. Drive with caution on all roads in Crete. All means of transportation, including donkeys, farm equipment, and tour buses use the roads at varying speeds. These facts are not truly understood by many of the tourists, or even the locals. Heraklion is the fifth largest city in Greece and there has been a settlement here since Neolithic times. Although few remains have been found in the city proper, it was probably a port for Knossos during Minoan and Roman times. The Saracens captured it in 824 A.D. and renamed it El Khandak (The Moat) after the moat they dug around it. The city was regained by the Byzantine Empire in 961 A.D. after many unsuccessful attempts. After the Crusaders occupied Constantinople in 1204, they gave Crete to Boniface of Monferrat who sold the island to Venice for one thousand pieces of silver. Under Venetian rule the arts flourished and “Candia”, as the Venetians renamed it, became a centre of learning. Many scholars and artists took refuge in Candia after the fall of Constantinople in 1453. The Venetians began construction of the city walls in 1462, which were completed more than a century later. The walls were 4km in length, of a triangular shape and had seven bastions. The Venetians also built the harbour and various other masterly architectural works. The walls proved their deterrent strength when the city was besieged for 21 years, one of the longest sieges in history. The final surrender came in 1669 after 100,000 Turks and 30,000 Venetians had been killed. Turkish occupation was heavily resented by the Cretans and continuous guerrilla warfare was waged against the Turks and, in return, the Turks often made reprisals against the Cretan population in the cities. Heraklion grew in size after the 1913 union with Greece. However, its strategic location again made it a target for invading forces in 1941. The German bombardment during the Battle of Crete caused a great amount of damage and after the war the city was extensively rebuilt. 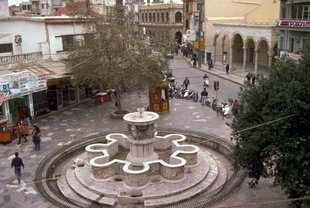 Chania was originally the capital of Crete. 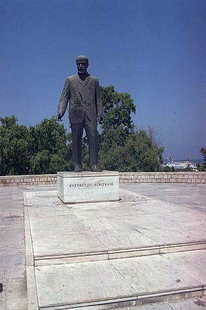 The administrative centre of Crete was transferred to Heraklion in 1971.